LokiJS is a fast, in-memory document-oriented datastore for node.js, browsers and Apache Cordova that provides a comprehensive API for storing and retrieving data. Unlike localStorage, with LokiJS there is no need to stringify for storage and access. LokiJS stores data to localStorage by default, but you can use other storage methods with ‘persistence adapters’, including an ‘IndexedAdapter’, which uses IndexedDB for persistence. For this tutorial we’ll be using the FileSystem adapter which stores the data using a JSON file saved in the FileSystem. This creates a new Ionic project using the blank template. There are other templates available such as ‘tabs’ and ‘sidemenu’ but we’ll stick with the blank one. Open the loki-notes directory and install the platforms needed. The app will depend on the following libraries, I have included installation instructions after each one. Used for storing app data. Used for truncating note descriptions. Used by LokiJS to store data to the filesystem. Unfortunately this library isn’t indexed in either bower or npm so you have to download it from Github and save it to the www/js directory. The dependency for the LokiJS FileSystem adapter. Used for capturing photos attached to each note. While we’re here, let’s reference the controller and services which we will be creating shortly. Services encapsulate common functionality within a single function. This allows us to have more concise code when calling different functions from the libraries we’re using. Services are stored under the www/js/services directory. Breaking down the code above, we first wrap everything in an ‘IIFE’ (Immediately-Invoked Function Expression) to avoid exposing the code to the global scope. Then we create the camera service. This uses the built-in angular service called $q which allows functions to be called asynchronously. This means we don’t have to wait for the camera plugin to return a result before the app becomes fully responsive. Once a photo has been selected from the default camera application, it returns control to the app. Inside the CameraService function we specify the default options for the camera. We’re specifying two options. quality which allows us to set the quality of the resulting photo (lesser quality means lesser file size) and correctOrientation which auto-corrects the photo orientation based on the orientation of the camera when the photo was taken. The CameraService has one method, getPicture which launches the default camera application in the device. At the beginning of the function we initiate the $q service by calling the defer method. After that, we specify a couple of options. encodingType which sets the format of the photo and sourceType which allows us to specify the source of the photo, in this case, the camera. After specifying the options, the default camera app is launched by calling navigator.camera.getPicture. This accepts three arguments: the success callback function, the error callback function and the camera options. We then expose this function to the outside world using the revealing module pattern. The note service (www/js/services/NoteService.js) encapsulates all the LokiJS function calls. Breaking down the code above. We use the Loki service provided by LokiJS to interact with the database. Inside the NoteService function are two variables. db which stores the reference to the current database we’re working with and notes which stores the reference to the current collection. Collections is just a fancy term for tables. The initialize function initializes the database, first creating a new instance of the Cordova filesystem adapter. This accepts an object containing the options we want to pass in. In this case, we want to specify the prefix used. Next we create a new instance of Loki. This accepts the name of the database as its first argument and the database options for the second. For the options, we’re setting autosave to true. This is because lokiJS doesn’t automatically save the data into the persistence adapter of your choice. Everything is stored in memory until you call the saveDatabase method in the db. Setting autosave to true means it will automatically call the saveDatabase method behind the scenes. An additional option named autosaveInterval is required when you set autosave to true. This is the interval in milliseconds in which LokiJS should persist the data. In the example below, the interval is set to 5000 which means that it will save every 5 seconds. The getNotes method loads the data stored in the notes collection. It creates one if the notes collection doesn’t exist yet. Note that we’re wrapping everything inside a call to the $q service. The syntax is different from the camera service but the idea is basically the same. The addNote, updateNote, and deleteNote functions serve as a wrapper to the LokiJS API for inserting, updating and deleting data from the database. All of which accept an object containing the note data as an argument. The only controller for this app is the note controller responsible for handling UI interactions in the app. Breaking down the code above. First we create NoteController and import all the services we need. – $scope: Allows us to get and set data to the current scope. This data can then be used inside the views. – $ionicModal: Used for creating a modal. – ionicPlatform: Used for listening for the ready event for Ionic. – CameraService: The camera service created earlier. This allows us to call the API provided by the camera plugin. – NoteService: The note service that we created earlier. This allows us to make calls to the API provided by LokiJS. Declare a me variable that will be used as a reference to the controller. Attach an empty array to the notes object and listen for the ready event in the $ionicPlatform. When this function is triggered, it means that the device is ready. It’s triggered only once when the app is launched so is the perfect place to initialize the database and get the data stored in the notes collection. Initialize the modals for creating a new note and viewing the image attached to the note. Add a truncate method to the controller. All this does is limit the number of characters for a string. This uses the truncate method in lodash which accepts the string you want to work with as its first argument and an object containing the options. In this case, we want to limit the character count to 35 characters minus the 3 characters used for indicating that the string has been truncated. By default lodash uses triple dots (…). Attach a deleteNote function to the current scope. This accepts an object containing the data for a specific note as its argument. All it does is call the deleteNote method from the NoteService. The newNote function is called whenever the new note button is clicked. This empties the note currently stored in the $scope and sets isUpdate to false. This will serve as a switch for determining whether the current note is an existing one (see saveNote method). Lastly, it opens the modal for creating new notes. The viewNote function is called whenever the user double taps on a specific note. First resetting the note stored in the scope and assigning a new value to it. It sets isUpdate to true because we’re trying to open an existing note so it’s understood that the user is either trying to view it or update it. Lastly we show the modal. The takePicture function is called when the user taps the camera icon on the header for the new note modal. It launches the default camera app and when a photo is selected, assigns it to the current scope. The saveNote function saves and updates the note to the database. It uses the isUpdate property to determine whether the current note stored in the $scope is to be updated or created. Once that’s done, we clear the note and close the new note modal. The viewImage function shows the image attachment in a fullscreen modal. The closeModal function closes the modal that’s specified as the argument. There’s one view in the app, the notes view, so create www/templates/notes.html and add the following. Breaking down the code above. First we wrap everything in an <ion-view> tag. This is the standard container for view content and any navigational and header bar information. We’ve specified two attributes, title, which is the name that you want to give to the view, and ng-controller, which allows us to specify the controller used for this view. An alias of note_ctrl is given so that we can refer to any data or function attached to the controller by using the alias. The <header> tag creates the header for the app and contains an <h1> element which displays the title of the current page and a <button> element for creating a new note. An ng-click attribute specifies that when this button is clicked, it will execute the newNote function attached to the $scope. The <ion-content> is used to specify the main content of the view. In this case the main content is the list of notes currently saved in the database. We create a <div> with a class of card for that and use the ng-repeat directive to repeat the element for every note stored in the notes array. Inside each card is a <div> with a class of item. This serves as the container for any content you wish to add inside the card. Here we’re just outputting the title of the note and its description. The on-double-tap attribute specifies the function executed whenever the user double taps on the item. This calls the viewNote function which opens the modal for viewing the note. The on-drag-right attribute specifies the function executed when the item is dragged to the right. This is a common gesture for removing something so we’ve attached the deleteNote function to it. If there are currently no notes in the database, we state that there are no notes yet. In Ionic, modals are created using a <script> tag which has a type of text/ng-template and a required attribute of id. The content is then wrapped inside an <ion-modal-view> tag. Inside is the header and the main content. The header contains the button for launching the default camera app, the title of the modal and the button for closing the modal. 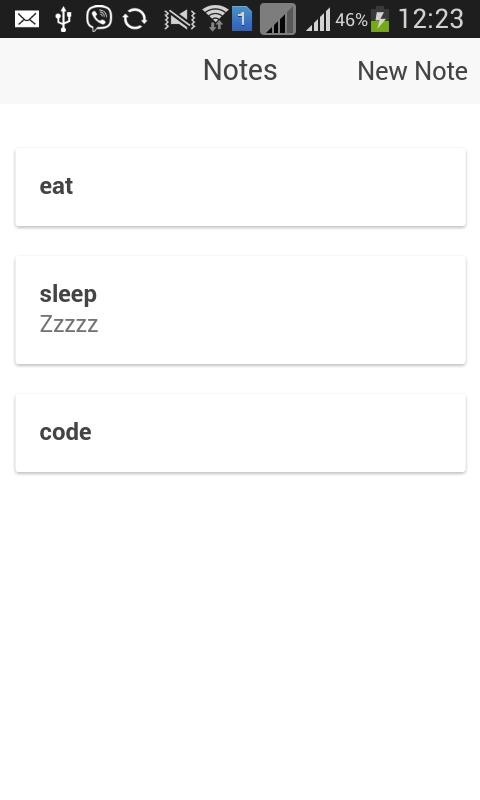 The main content is a form containing the text fields for title and description, and a button for saving the note. If a photo is attached to the note, an icon button is added. This will open the photo in fullscreen view when tapped by the user. The image modal displays the image attachment in fullscreen. This is shown when the viewImage function is called. To bring everything together, open the www/js/app.js file and register lokijs right after ionic. Then add the configuration for the app state. Since we have one page, we only have one state called notes. By using the state method we specify the name of the state, the url it can be accessed, and the path to where the view is (relative to the www directory). Lastly, we specify the default URL in which to navigate to. Find: In this tutorial we haven’t performed any complex queries, so check out the documentation on the find method. Changes API: If you need to persist data on a server, the changes API is useful. It allows you to sync changes made in the local copy of the database to a remote server. The full code for this tutorial can be found on Github and if you have questions or comments, please let me know below.